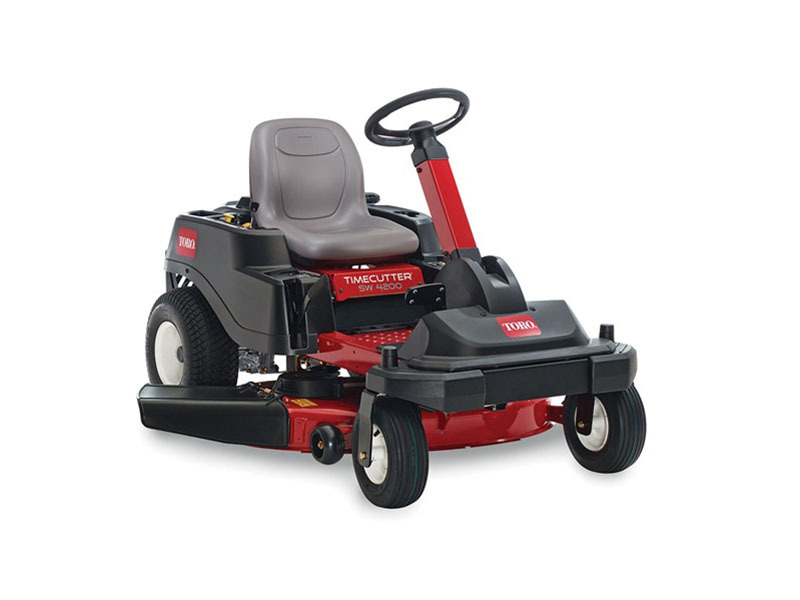 Toro’s innovative TimeCutter® SW is the perfect blend of a zero turn mower and lawn tractor. You get the controls and side hill stability of a lawn tractor with the maneuverability and time savings of a zero-turn lawn mower. The redesigned cutting deck will leave your lawn looking perfect. The TimeCutter® SW4200 42 in. 24.5 hp Toro Commercial V-Twin 708 cc w/Self-Cleaning Air Filter Housing. This Zero-Turn Riding Mower has a 2--blade mowing system under a 4 inch deep, top discharge deck design with convenient washout port. The mower boasts 7 cutting positions between 1-1/2 in. and 4 -1/2 in. in height. TORO 452 CC ENGINE: The Toro 452 cc engine provides dependable performance and reliable starting with full pressure lubrication and spin-on oil filter. 42 IN. (106.7 CM) MOWING DECK: Toro's four inch (10.2 cm) deep, top discharge deck design provides superior cutting performance in all conditions. Anti-scalp wheels allow the deck to float over the turf and reduce scalping. Create your own natural fertilizer by adding a Recycling Kit® or make yard clean-up a snap with an optional Twin Bagging system. 42 in. (107 cm) 13 gal.